David Batchelor is an artist and writer who has written about and worked with colour for around 25 years. His books include Chromophobia, published in 2000, in which he examines the ways in which artists, philosophers and anthropologists have attempted to vilify colour and purge it from our society. He gives the examples of all-white architecture as the epitome of “cool”, and the way that Minimalism is often revered with an attitude that verges on religiosity (as a style and life theory as well as an art movement). Batchelor also argues that colourful art is often ignored, if not by the market, then by theoreticians and critics, who often fail to analyse colour closely. Read more about why we don’t trust colour in art here. More recently, in 2014, Batchelor released another book entitled The Luminous and the Grey, which explores the hazy zone where colour and non-colour meet. His writings draw on sources as wide-ranging as neuroscience, popular film, architecture, fine art and scientific history. His new commission, Sixty Minute Spectrum, which opens today, turns the roof of the newly restored Hayward Gallery into a chromatic clock. RRJ Editorial: Please will you introduce yourself for our readers? David Batchelor: I am an artist and writer based in London. About 25 years ago I stumbled into colour, entirely by accident, and I still haven’t found a way out. RRJ: You’ve spent your career working with and talking about colour. Why do you think it’s such an important topic for the modern day? DB: We are surrounded by colour by day and by night in the city, when we are awake and when we are dreaming, but at the same time we don’t really understand what colour is or what use it serves, and we don’t have good enough words to describe it. So colour is both very familiar and deeply strange to us, and that’s enough to make it interesting to me. In addition, the colours we see in the city are the constantly changing products of industrial chemistry, electrification, and more recently digital technology. New materials become available and that changes the look of older materials. A few years ago making art from neon looked quite contemporary, now it seems rather quaint and LEDs are everywhere. RRJ: You talk eloquently in your book Chromophobia about how colour has been reviled and feared for centuries, particularly among the fine arts. Do you see any change in this attitude, either in the present or potentially in the future? DB: I wrote Chromophobia in the late 1990s and, at the time, it felt like colour was entirely marginalized in the art and the theory that I was aware of. A lot has changed since then and now there is a greater diversity of art from a greater diversity of places. There is more room these days for different ways of doing art to coexist and that has to be a good thing. RRJ: How does your work as an artist inform your work as a writer and theoretician? Or is it the other way around? DB: Everything I have written about colour has come out of working with colour in the studio. But I don’t write directly about my own work and I don’t write about colour in the history of art, or not much. In truth I don’t write about colour very much: I write about ideas about colour, which is perhaps cheating but it is also a lot easier. RRJ: One of the most interesting things about your writing is how you approach a seemingly-simple topic such as colour from such a diverse range of angles, from art to neuroscience. How do you manage the relationship between art and science in your work? DB: One of the pleasures of working with colour is you can find interesting material pretty much anywhere you look – in philosophy, science, literature, anthropology, linguistics, film, music – so there is always more to discover and more to reflect on in and out of the studio. I certainly work with the products of science but there is nothing very scientific about my approach or method, which is generally improvised and rather haphazard. Notice something, have an idea, do something, watch it fail, notice something in the mess, have an idea, do something, watch it fail: things always get made in the process but rarely – if ever – the things you set out to make. 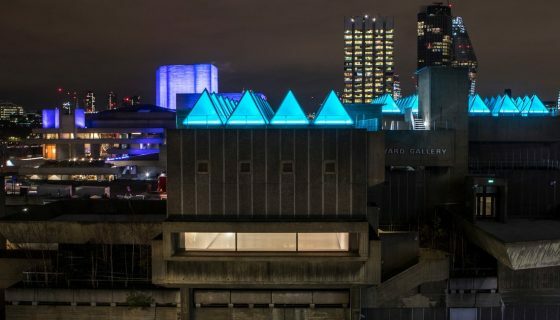 Sixty Minute Spectrum by David Batchelor can be seen on the roof of the Hayward Gallery until 25 March 2018. Read more here.